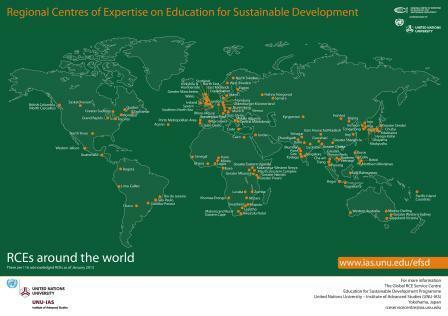 A meeting of the UK RCEs (Regional Centres of Expertise) on ESD (Education for Sustainable Development), endorsed by the United Nations University, will take place in Cheltenham on 21 June 2013. Hosted by RCE Severn based at the University of Gloucestershire, this meeting will welcome the two new members of the UK RCE family, share recent activities and projects, discuss outcomes of recent European RCE meetings and explore pathways for support and collaboration among the eight RCEs in the UK, namely East Midlands, Greater Manchester, London, North East, Scotland, Severn, Wales, and Yorkshire & Humberside. Dr Zinaida Fadeeva, an Associate Fellow for the Education for Sustainable Development Programme of the UNU Institute of Advanced Studies, will convene and guide the discussion. The London Regional Centre of Expertise (RCE) on Education for Sustainable Development (ESD) held its third Partners /Steering Group meeting in 2013 at Royal Botanic Gardens, Kew on 14 June 2013. After this meeting hosted by Botanic Gardens Conservation International (BGCI), participants enjoyed the opportunity of wandering in Kew Gardens on a sunny day. In addition to the Partners /Steering Group meetings, this year saw the London RCE’s first ever AGM, held at London Legacy Development Corporation (LLDC) in Stratford on 20 March 2013 (Read a news post on the inaugural AGM and The Annual Report 2012/13). The next meeting will be held at London South Bank University in September 2013. DEBATE: Global Learning: The Future of Education? A debate on ‘Global Learning: The Future of Education?’ will take place at Institute of Education (IOE) University of London on 25 June 2013 from 6 to 7.30pm. Two leading IOE academics – Dr Douglas Bourn and Dr Alex Standish – with differing viewpoints on global learning’s value and contribution to the future of education will speak in this debate which will be chaired by Professor David Lambert. Dr Bourn is Director of the Development Education Research Centre at IOE and editor of the International Journal of Development Education and Global Learning. Dr Standish is Lecturer in Geography Education at IOE and the author of The False Promise of Global Learning: Why Education Needs Boundaries.